↑ "临夏旅游" (Linxia Tourism), published by Linxia Hui Autonomous Prefecture Tourist Board, 2003. 146 pages. No ISBN. Pages 26-27. ↑ Willy Lam accounts for Hu's actions on March 5 as a potential case of his high-level political cunning and shrewdness, see Lam, p9. 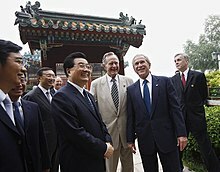 ↑ "Hu Jintao reelected Chinese president", Xinhua (China Daily), 15 March 2008. ↑ ক খ "China"। Berkley Center for Religion, Peace, and World Affairs। ২০১৩-০৩-১৬ তারিখে মূল থেকে আর্কাইভ করা। সংগ্রহের তারিখ ২০১১-১২-১৪। See drop-down essay on "An Era of Opening"
↑ Willy Wo-Lap Lam. (2006). 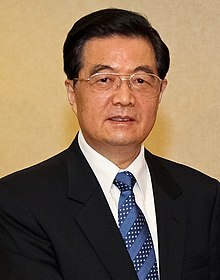 Chinese politics in the Hu Jintao era: new leaders, new challenges. M.E. Sharpe. p. 5.